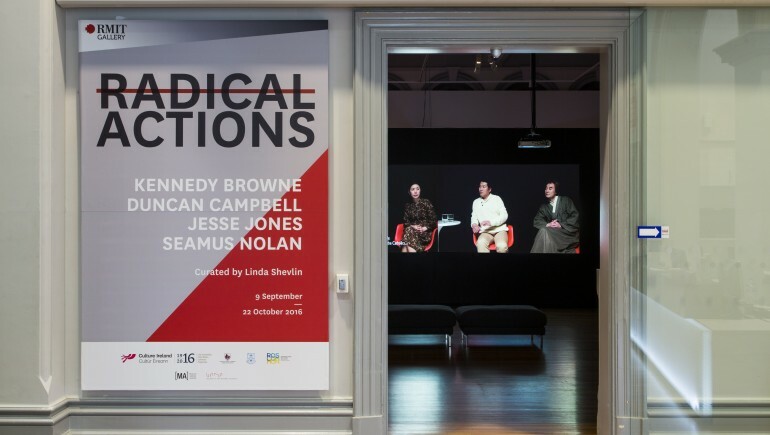 Irish artists Kennedy Browne (Gareth Kennedy & Sarah Browne), Duncan Campbell, Jesse Jones and Seamus Nolan exhibited existing works at RMIT Gallery Melbourne in September 2016. The exhibition titled Radical Actions looked at how events in recent and distant history, attitudes to rebellion, revolution and agitation have formed societies and National identities. Revolutions are about antagonism and agitation, and this is above all, true of events a hundred years ago. A dramatic and emotionally driven gesture, the 1916 Rising is rumoured to have inspired revolution in India, Vietnam and many parts of Africa. It was planned by men and women who feared that without a dramatic action of this kind, the sense of national identity that had survived all the hazards of the centuries would flicker out ignominiously within their lifetime. The 1916 Commemoration should not be a time for soft words or a gazing backwards through a green-tinged prism at an idealised past. There is an urgency for an assessment of Irish identity within broader international and global contexts. Radical Actions questioned the role of the artist in imagining future states and explores the impact this revolutionary period has had on Irish citizens. Among the works in this exhibition was the film Bernadette by Turner Prize winner Duncan Campbell. One of a trilogy of films, it focuses on female Irish dissident and political activist Bernadette Devlin. Campbell’s film works with already mediated images and writings about her in an effort to do justice to her legacy while also striving for what Samuel Beckett terms, “a form that accommodates the mess”. Jesse Jones film piece The Other North casts professional Korean actors to re-enact scenes from a conflict resolution therapy session in 1970s Belfast. The sessions were organized by American psychologist Carl Rogers, known as a proponent of psychotherapy, documented and long ago forgotten. The exhibition also presented Seamus Nolan 10th President Campaign. Recent works include F**K IMMA for ‘What we call love, Surrealism to now’ in the Irish Museum of Modern Art 2015/16 and What if we got it wrong? Centre Culturel Irlandais, Paris, while Kennedy Browne, the collaborative practice of Gareth Kennedy & Sarah Browne will be revisiting their work The Special Relationship which looks at Ireland’s position as a neutral State that allows the use of airports as a stop-off point for US military. RMIT University Gallery is housed in Storey Hall, first built as a Hibernian Hall in 1887 and remodeled in 1995 where its Irish Heritage is referenced in the buildings exterior architecture. The exhibition occupied galleries 1 & 4 of this prestigious space. Culture Ireland’s international culture programme entitled I Am Ireland is part of the Ireland 2016 Centenary Programme.